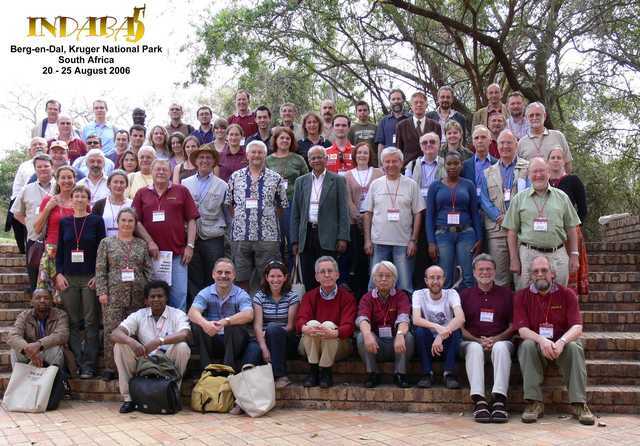 Participants at Indaba V, Kruger National Park, South Africa. A separate identification key is available. The legend gives the following names. 1 Demi Levendis, 2 Martin Elgi, 3 Bernard Ormondi, 4 Alvaro de Sousa, 5 Manuel Fernandes, 6 Tom Koetzle, 7 Luigi Nassimbeni, 8 Pari Antalis, 9 Gary Battle, 10 Lee Brammer, 11 John Ogilvie, 12 Michail Atanasov, 13 John Helliwell, 14 Jan Dillen 15 Dave Billing, 16 Gregory Halder, 17 Simon Iremonger, 18 Kirsten Corin, 19 Ann Almesåker, 20 David Bray, 21 Alessia Bacchi, 22 Alexei Kuznetsov, 23 Melanie Rademeyer, 24 Daniel Vercauteren, 25 Gert Kruger 26 Roland Boese, 27 Gideon Steyl, 28 Ashwini Nangia, 29 Natasha Sciortino, 30 Susan Robertson, 31 Petra Bombicz, 32 Susan Bourne, 33 Madeleine Helliwell, 34 Howell Edwards, 35 Howard Flack, 36 Karl Törnroos, 37 Peter Comba, 38 Marion Kerscher, 39 Savo Bratos, 40 Joel Bernstein, 41 Mike Zaworotko, 42 Gautam Desiraju, 43 Gábor Speier, 44 N Bridget Makhura, 45 Bert Hultshof, 46 Delia Haynes, 47 Tereza Varnali, 48 Zorka Papadopolos, 49 Jan Boeyens, 50 Erik Larsen, 51 Jaqueline Cole, 52 Elena Boldyreva, 53 Augusto Machatine, 54 Geoffrey Kamau, 55 Andrzej Katrusiak, 56 Greta Heydenrych, 57 Hans-Beat Bürgi, 58 Yuji Ohashi, 59 Andreas Lemmerer, 60 Sven Harnung, 61 Dave Liles. 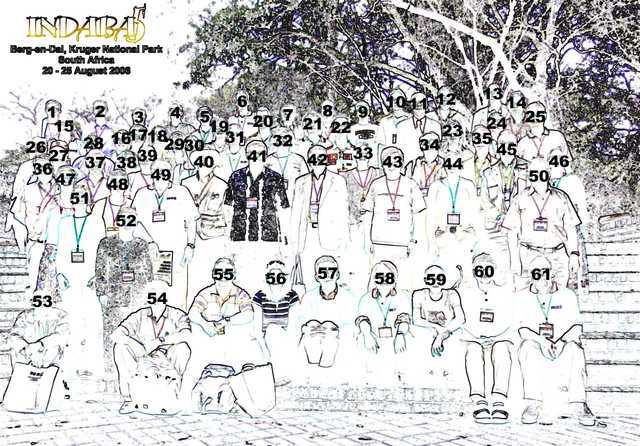 Identification key for participants at Indaba V, Kruger National Park, South Africa. 1 Demi Levendis, 2 Martin Elgi, 3 Bernard Ormondi, 4 Alvaro de Sousa, 5 Manuel Fernandes, 6 Tom Koetzle, 7 Luigi Nassimbeni, 8 Pari Antalis, 9 Gary Battle, 10 Lee Brammer, 11 John Ogilvie, 12 Michail Atanasov, 13 John Helliwell, 14 Jan Dillen 15 Dave Billing, 16 Gregory Halder, 17 Simon Iremonger, 18 Kirsten Corin, 19 Ann Almesåker, 20 David Bray, 21 Alessia Bacchi, 22 Alexei Kuznetsov, 23 Melanie Rademeyer, 24 Daniel Vercauteren, 25 Gert Kruger 26 Roland Boese, 27 Gideon Steyl, 28 Ashwini Nangia, 29 Natasha Sciortino, 30 Susan Robertson, 31 Petra Bombicz, 32 Susan Bourne, 33 Madeleine Helliwell, 34 Howell Edwards, 35 Howard Flack, 36 Karl Törnroos, 37 Peter Comba, 38 Marion Kerscher, 39 Savo Bratos, 40 Joel Bernstein, 41 Mike Zaworotko, 42 Gautam Desiraju, 43 Gábor Speier, 44 N Bridget Makhura, 45 Bert Hultshof, 46 Delia Haynes, 47 Tereza Varnali, 48 Zorka Papadopolos, 49 Jan Boeyens, 50 Erik Larsen, 51 Jaqueline Cole, 52 Elena Boldyreva, 53 Augusto Machatine, 54 Geoffrey Kamau, 55 Andrzej Katrusiak, 56 Greta Heydenrych, 57 Hans-Beat Bürgi, 58 Yuji Ohashi, 59 Andreas Lemmerer, 60 Sven Harnung, 61 Dave Liles.